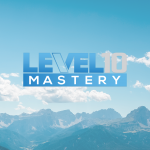 Level 10 Mastery - Podcast - Business Coaching - Ben Lawler & Gunner Deflorian | Bonus Episode – 5 Tips For Success In The New Year! In the next few minutes, I’d like to share the 5 principles that can help you make 2018 your best year yet. – The difference between an expert and an amateur. The expert has failed more times than the amateur has tried. 2. Give Your Absolute Best Every Day. Focus on your highest energy state. You can be a meaningful specific, or a wandering generality. 4. Always be growing. Raise the bar on a regular basis. Find an accountability partner. Someone who won’t let you off the hook. 5. Be resilient. You will be kicked in the teeth. How you handle your stress determines your success. – Learn from the challenging times, learn from your failures. Recover quickly from difficulties. In closing, set big goals. Find your peak energy state. Schedule everything, always be raising the bar, increase your mental toughness. Most importantly, have fun and become the best version of yourself. Give Your Absolute Best Every Day. Focus on your highest energy state. Always be growing. Raise the bar on a regular basis. Find an accountability partner. Someone who won’t let you off the hook.